Easily fits most standard size toilet & commode seats. •Ideal solution for lowering to or raising from the toilet. 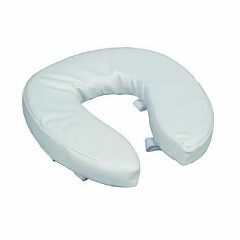 •Comfortable foam padding helps minimize pressure points. •Easily attaches to seat with hook and loop straps that hold seat cushion firmly in place. •Constructed of foam padding upholstered in vinyl. •Can easily be wiped clean with any anti-bacterial cleaner.